Indians all over the globe are gearing up to celebrate Diwali tomorrow. It’s the season when gifts are exchanged and families and friends bond over delicious meals. No Diwali spread is ever complete without a variety of traditional sweets and mithai. 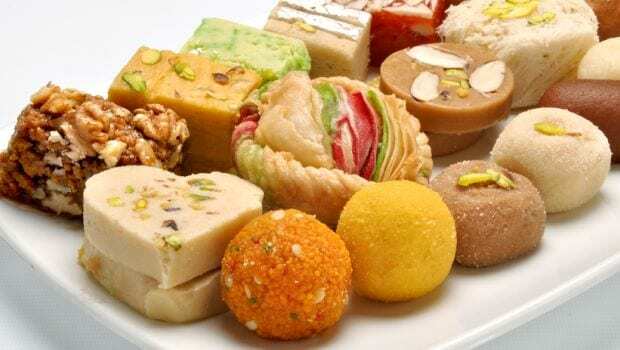 All of us have been guilty, at some point or the other, of over-indulging in Diwali-ki-mithai; be it motichoor ke ladoo or the simple khoya barfi, kaju katli, pista barfi and so much more. Thanks to the festivities in the air, these become irresistible and before you realise it, you’ve polished off more than you would have liked! Most mithai shops are now loaded with Diwali sweets, these fly off the shelves as customer after customer walks out with kilos of mithai. However, do spend a few minutes mulling over what goes into the making of these traditional sweets; how are they actually made in bulk to meet the increasing demand and what is the quality of ingredients used? Increasing demand could often lead to some shops compromising on the quality through adulteration. Most mithais that are consumed during festivities are made with khoya and it makes for one of the most adulterated foods that is used to prepare sweets. It is believed that some unscrupulous sellers may add wheat or rice flour (starch) to increase the quantity. So even if you are making a mithai with khoya, be careful and check for its purity. According to Dr. Saurabh Arora, Director of Auriga research and Arbro Pharmaceuticals, “most consumers buy sweets and savouries that give an impression of great taste. This is why vendors use bright and sometimes non-permitted colours of sweets and savouries. These vendors use artificial colours because they are less expensive, more stable and long lasting and give the product an appealing bright colour.” Motichoor ladoo is one such mithai that must only be bought from reliable sellers this festive season. Kaju katli has silver varq on it which adds to the appeal of this popular traditional mithai. According to Indian regulations, silver must be 99.9 percent pure if it is used as a food ingredient. However, considering the expensive metal that silver is, it may turn out that vendors use aluminium foils that only look like sliver varq. Therefore, it is good to make kaju katli at home in order to save yourself from the harmful effects of these fake substances. If you think you are eating sweets made using real pista and cashews, you should probably think again. Not real nuts, what ends up being used mostly are artificial or synthetic flavours. Pistas and cashew nuts are expensive nuts, so this is done to cut costs and make the mithai last longer. The paneer that is used to make the barfi could have excessive corn starch in place of milk extract. In some cases, harmful chemicals and urea are also mixed in it. Therefore, it is imperative to take any paneer mithai from a trusted source or just make it at home. While these are just a few mithais that are known to be highly adulterated, there are many others that are flooding the markets. Health experts suggest either switching to homemade sweets that don’t need dairy products or just choose to eat alternatives like chocolates and nuts. Be careful of what you buy next and always buy your share of Diwali sweets from trusted vendors and seller.